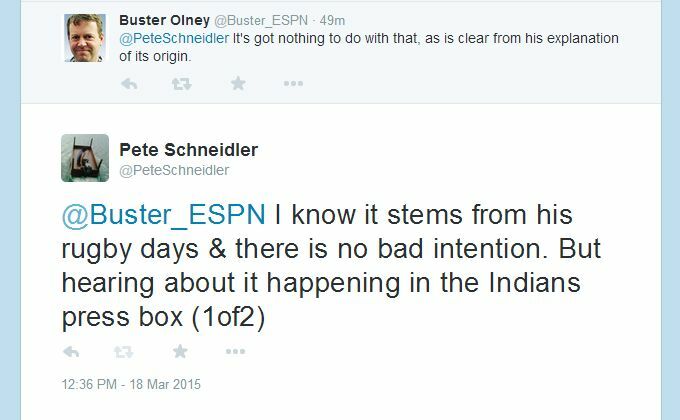 Short back and forth with Buster Olney that prompted me to write this blog post. I sent that tweet as a part one, with the “maybe I’m hypersensitive” being part two. Anyway, so to complete the background context, this all started when I was listening to the baseball tonight podcast from 3/16/15. I like the podcast and all of the guests and generally agree with most but not all of the baseball analysis. It’s generally fairly light and fun stuff that I just listen to while getting ready in the morning or working on my truck or whatever, along with podcasts from Baseball Prospectus, Freakonomics, NPR’s Planet Money, and several more. Anyway on the 3/16 podcast there was a segment with Paul Hoynes beginning at 27:30. He is the baseball beat writer with the Cleveland Plain Dealer. As he explains on the podcast, he played rugby at Marquette and they used to do this “war cry” all the time as teammates. Then he did it one night at a bar in Tucson Arizona while working as a reporter covering spring training, and it has taken on a life of its own. Now it has become a tradition that he does the war cry in the press box, during each Friday and/or Saturday home game, and there is a $2 pool to pick which half inning he will do it and the winner gets the $34. At the end of the segment he does the goofy thing and that’s it. Later in the podcast Buster and his producer agree that the war cry should end all of their podcasts from now on. 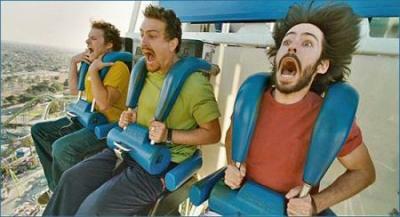 It’s a funny thing, and seems harmless enough. Until I kind of did a mental double take and realized “Hey wait a minute…he covers the Indians!” I did this double take actually about 3 seconds after he finished the war cry. I think it was right after I had the thought that it sounds an awful lot like a stereotypical “indian” war cry from an old west movie or something. So I did a double take. He is doing this self-described war cry, in the press box of the “Chief Wahoo” (logo) Cleveland Indians, whose name has come up a lot in the last several years as far as whether the name is offensive, or should be changed, etc. 12:34 @PeteSchneidler It’s got nothing to do with that, as is clear from his explanation of its origin. 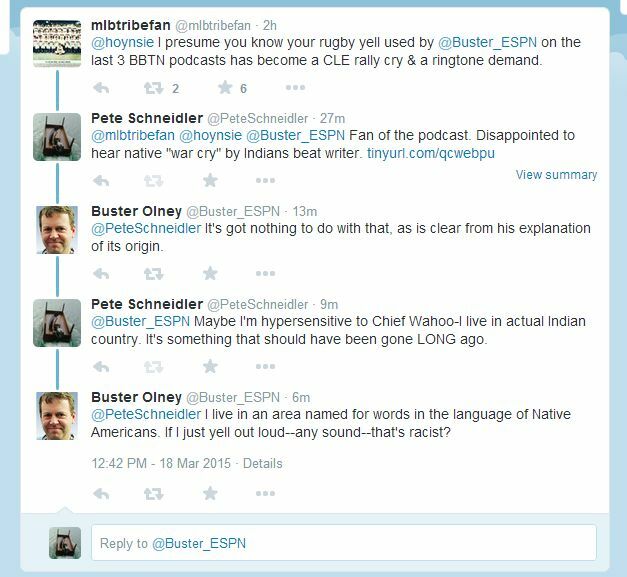 12:39 @Buster_ESPN Maybe I’m hypersensitive to Chief Wahoo-I live in actual Indian country. It’s something that should have been gone LONG ago. 12:42 @PeteSchneidler I live in an area named for words in the language of Native Americans. 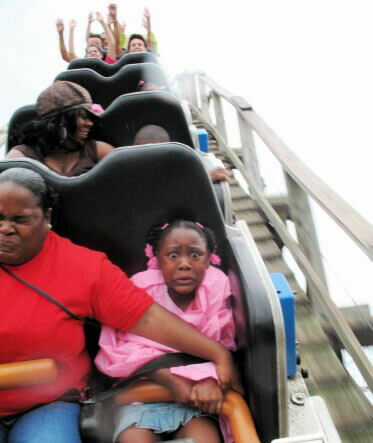 If I just yell out loud–any sound–that’s racist? Buster’s first rebuttal is that it isn’t about Chief Wahoo. I say I know that wasn’t how it started out and that isn’t what its about for Hoynes himself, but (and this is where the twitter character limit is an issue) it just still seems like making a war cry yell in the press box of an Indians game in this day and age, and talking about it nationally, probably not a great idea. Then he comes back with a more ridiculous argument the 2nd time that isn’t worth any more of our time. But it’s interesting that his opening argument was that this has nothing to do with the racism/offensive/chief wahoo angle, then his second argument is focused on minimizing the perceived impact of that same angle. FINALLY, my argument, in one paragraph. We don’t get to decide what hurts other people’s feelings. Sometimes my kids and their friends (or my wife and I) will argue or tease or whatever and someone walks away with hurt feelings. Oftentimes the “perpetrator” feels like the “victim” is overreacting and making a big deal out of nothing. And maybe they are. But if the “perp” cares about that person at all, it is really on the “perp” to adjust their behavior to avoid the hurt feelings the next time. If they really care about them, they might even apologize. And this example I have used from my family doesn’t take into account the centuries of baggage and abuse and other crappy seeds that have been sewn to create the current race relations between native americans and the majority culture. I get that Hoynes and the folks in the press box mean no harm by this silly tradition, and they’ve been doing it for 30 years and its all in good fun. But this is an inflamed, hurtful issue and a big, big deal for a lot of natives who currently number about 5m in the USA. Even if you mean no harm by it, basically don’t be a stumbling block for your brother. That’s it. I know that there are a whole lot of Chief Wahoo supporters, including some natives. But there is no denying there are a bushel-full of those who are against it, from tribal councils to individuals to knitting circles to church committees, who have written blogs and sent letters and otherwise petitioned the Indians to change the name for many years. They’ve protested at opening day outside Jacobs or Progressive Field for over 20 years I believe. If you google it or click just some of the links I put up above you will see there is a LOT of heartfelt opposition and first-person descriptions of how it is deeply symbolic and hurtful. So, to my way of thinking anyway, strip away 90% of the noise about this issue and you still have these facts – a whole lot of people are really hurt by it and the Cleveland Indians won’t change anything…because they just don’t care very much. This was copied from one of the links above. I can just hear some Indians fans of Jewish/Chinese descent arguing they have no problem with this, they would wear it, it honors their culture, etc. But come on. And this isn’t even a very true metaphor because we didn’t invade the land of the Jews or Chinese, decimate their population, take away much of their ability to provide for themselves (hunt and gather), and forcibly relocate them and take away their way of life. Yes, I know that is in the history books, but that just means it *actually happened*. And sure, at some point people do need to move on. But that is something each person has to do, and our country still has a lot of work to do in terms of justice and reconciliation toward our native citizens. (If you don’t believe me then check out the comment threads you will find accompanying some of these links and others) Going back to the hat metaphor, the only thing close I can think of would be like the “Berlin Jews” (or Frankfurt, or Auschwitz) soccer team. Good idea? No. Would you tell the protesting Jews to develop thicker skin? Maybe if the protest was happening a thousand years from now. But even then probably not. The ‘Indians’ name should probably go, and Chief Wahoo should definitely go. DISCLAIMERS! I don’t spend that much time and energy usually on this kind of thing. Definitely my first post ever defending what some might perceive as “political correctness.” But I wanted to respond to Buster in a way that was impossible via twitter due to the character limits. Buster and his producer Josh put on a great podcast that I enjoy for free almost every day. Buster is also a really smart guy and I didn’t write this because I enjoy the debate. I’m not a troll, nor do I get off on engaging with public figures. I wrote this because I despaired about ever being parsimonious enough to put something that made sense into tiny twitter bursts. Buster and Josh have to put together almost an hour of entertaining and insightful dialogue about baseball like 250+ days out of the year, and that’s a challenge I don’t even fully understand. I also have no axe to grind with Paul Hoynes – I’ve heard him on the podcast many times and appreciate his input as someone close to the team. Also I’m a big fan of the Cleveland Indians front office in terms of their baseball acumen. Was just reading on fangraphs about how they are, by one measure, #1 in getting the most bang for their limited buck. Actually this all started when I got on twitter and was surprised to not see feedback about the war cry and figured if noone else was going to say anything that maybe I should. I know this is a hot button issue that often draws ugly comments. I moderate all my comments so if you just need to vent your spleen go ahead but it won’t get published. I’ll publish and try to respond to reasonable comments from any side of the issue, but I’ve already spent way more time on this than I intended.